Rift Valley Traffic Commandant Zero Arome said Sunday the accident involved a bus heading to the capital city, Nairobi, from Busia County and a truck heading from Nakuru County to Eldoret town. Arome says the bus's brakes are suspected to have failed. 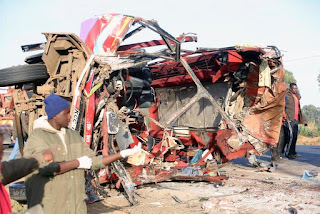 The National Transport and Safety Authority has been criticized for failing to reduce road accidents, which account for around 3,000 Kenyan deaths every year. While authorities have blamed careless road users, unroadworthy vehicles and speeding for the accidents, other observers say poor road construction and maintenance are to blame.